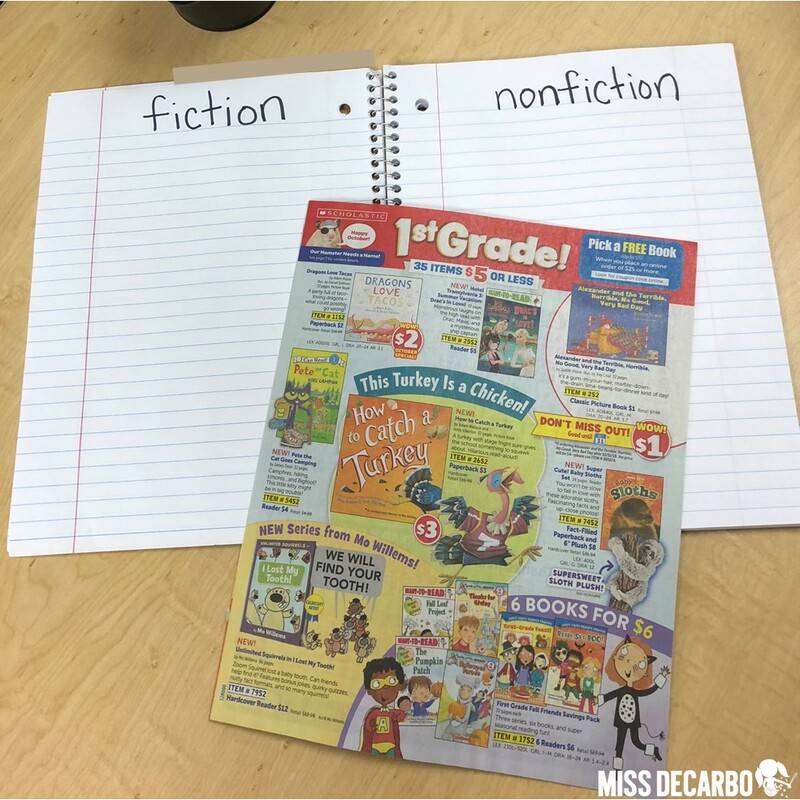 Teaching little readers the difference between fiction and nonfiction text is important, fun, and interactive! 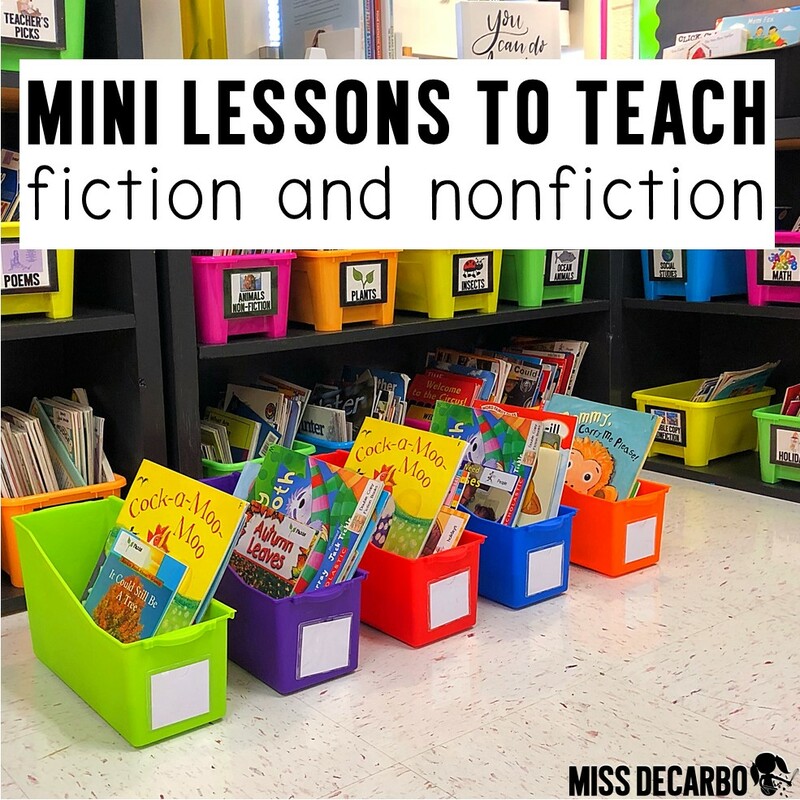 In addition to identifying whether a text is fiction or nonfiction with everything we read throughout the year as a class and during small group lessons (after all, repetition is a brain-based strategy), I also complete three staple “mini-lessons” with my students. 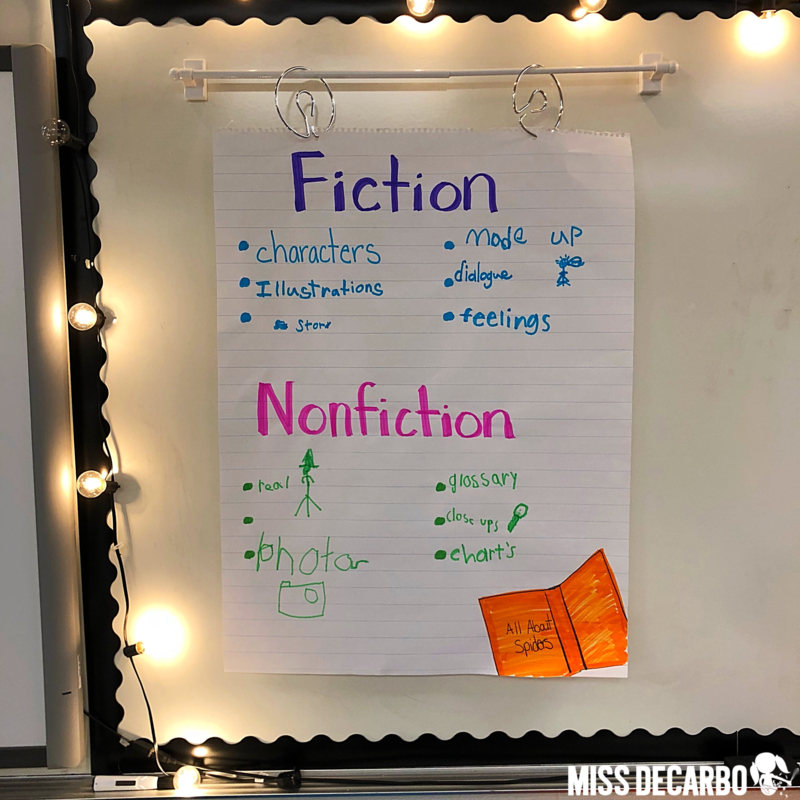 In today’s blog post, let’s dive into these three simple and quick lessons that have always helped my students grasp the concept of fiction and nonfiction. When I teach a new concept or skill to my students, it’s important that it be hands-on. 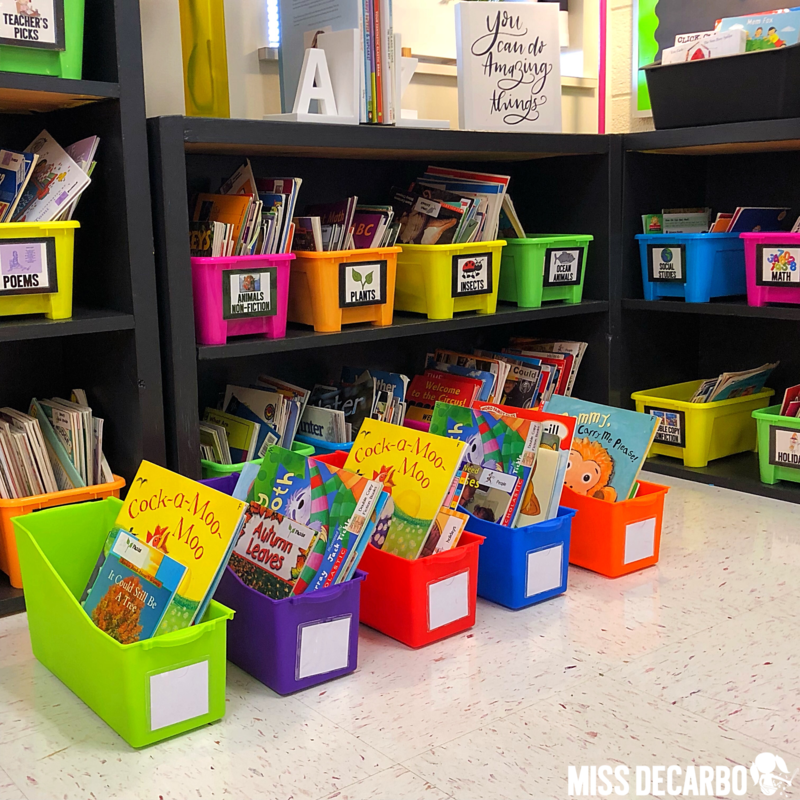 So, when I’m first introducing fiction versus nonfiction text, I go through a small pile of fiction and nonfiction books with my students, and we discuss the differences between the two categories together. Then, I put a variety of fiction and nonfiction books from our classroom library into book bins. Next, I set a book bin out on each table. 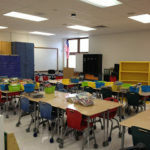 I give the students 5-10 minutes to sort the books into two piles: fiction and nonfiction. 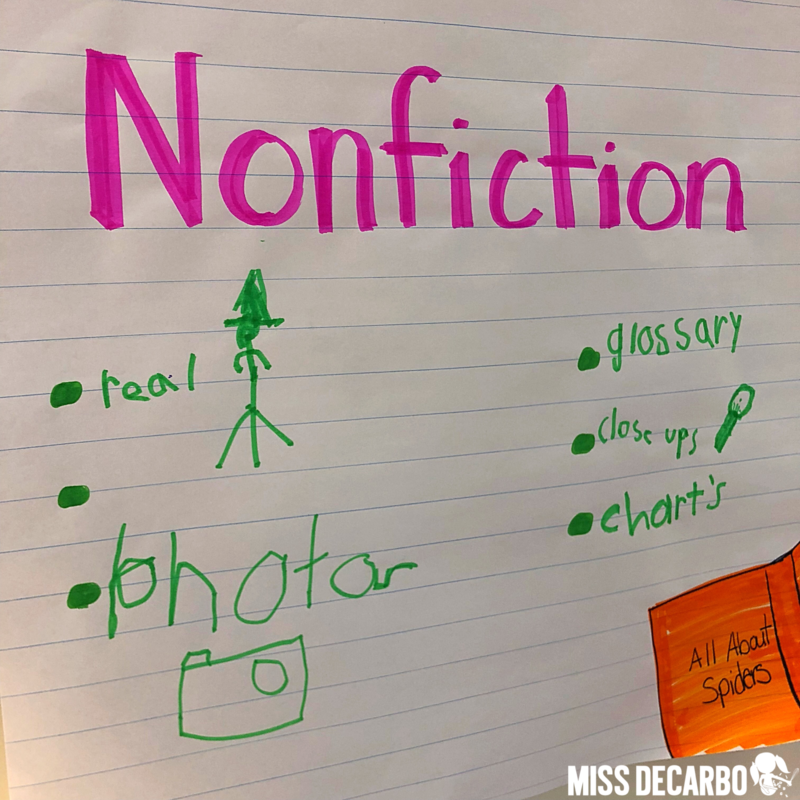 Then, I ask them to go through the books and take note of some things the fiction books all have in common and some characteristics that the nonfiction books have in common. As students work together to explore the books in their group’s book bins, I circulate the room. While they work, I point out features students are looking at, such as the table of contents page the student in the photo above was looking at. Then we grab another book from the group’s nonfiction pile and we find the table of contents page in that book, too. 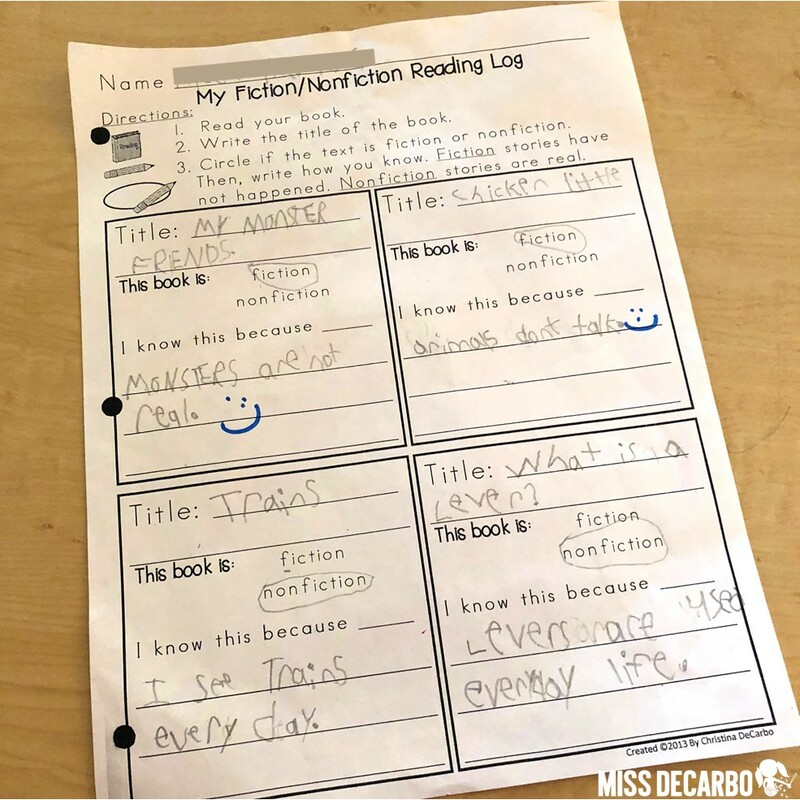 The students start to really take note of similar characteristics and features of fiction and nonfiction books. Our room is always buzzing with excitement and the type of conversation that can only come from enthusiastic and eager new readers! 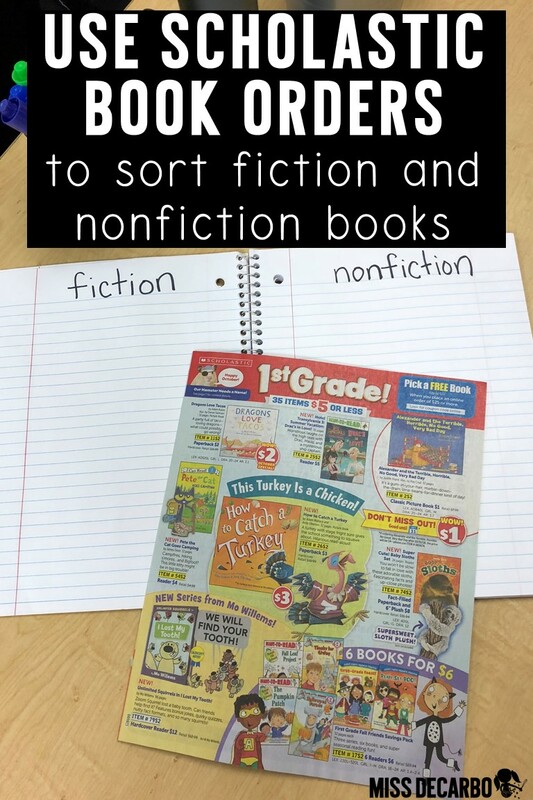 After students explore and sort their book bins, we gather to create an anchor chart for fiction and nonfiction texts. The students created the chart based on what they discovered in their groups. It is really important to me that anchor charts be student-created. My goal is for students to have the opportunity to directly interact with the chart. This gives them ownership over their learning. 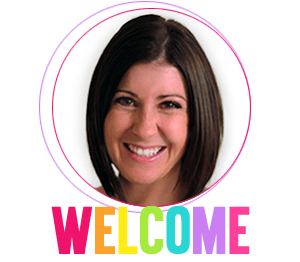 (You can read all about my philosophy on anchor charts verse posters and grab some anchor chart freebies in a blog post in my Anchor Chart Blog Post.) The picture above shows what our fiction and nonfiction anchor chart looked like after our lesson. Whenever we could, we drew a picture beside the feature of text to help us remember it. I absolutely loved that the students applied their group conversations to our class chart. They also referred to this anchor chart on their own since THEY were the ones who created it. 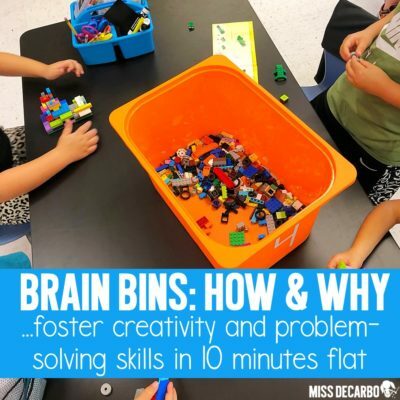 The chart became a valuable resource for them and this mini-lesson definitely stuck with them! The third lesson we completed was a lesson that allowed my students to apply their knowledge of fiction versus nonfiction. I gave each student a Scholastic Book Club magazine. (I’m sure you get extra catalogs like I do all the time. Don’t throw them away! 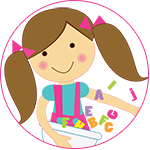 Instead, stash them and use them for mini-lessons such as this one!) 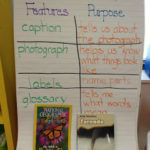 As you can see in the photo above, each student wrote fiction on one side of their notebook and nonfiction on the other. Then they used the magazine to cut out pictures of books and sort them by fiction and nonfiction. They loved this lesson! While they worked, many of them started talking about their likes and dislikes of book titles, favorite topics to read about, and more! This was a lesson that really helped my students apply their learning. 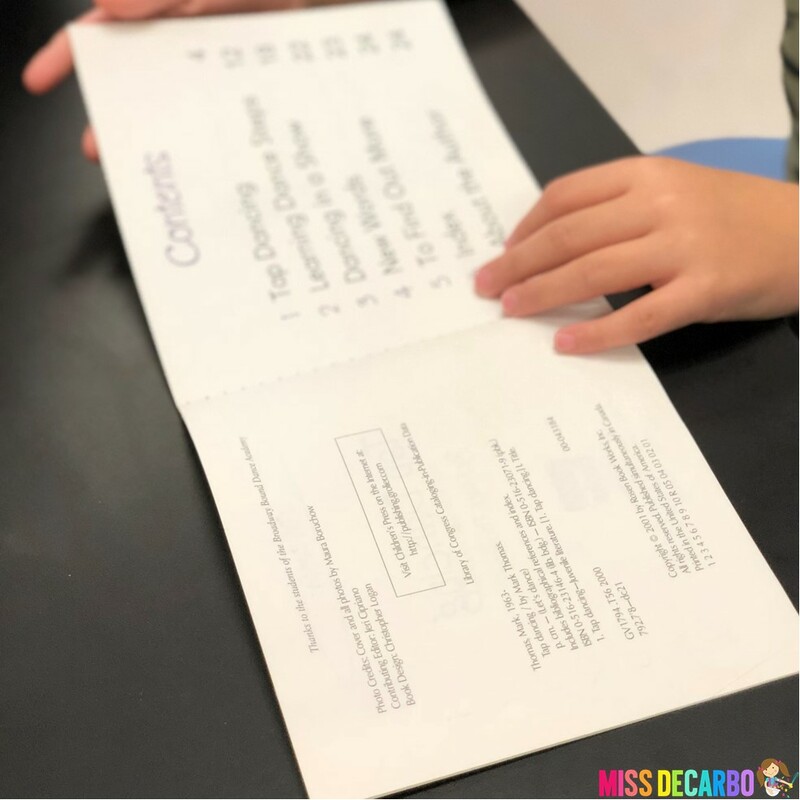 If you’re looking for a way to release independence to your students by having them show their learning during their Read to Self time, Partner Reading time, or while they read at home, you can use my fiction and nonfiction reading log from my Skill Based Reading Logs pack. I sent this log home with my students the week after we completed the lessons above. The students had to read their nightly book, circle fiction or nonfiction, and write how they knew. It was a GREAT way to see if they could identify a fiction or nonfiction book on their own. 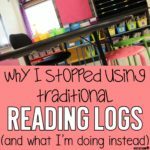 If you want to read more about how I use Reading Logs in my classroom and why I stopped requiring a parent signature (and ditched traditional logs), check out my Reading Logs Blog Post here. 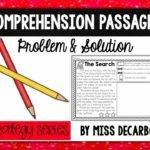 This pack also contains TONS of other skills and strategies that you can use for other comprehension lessons. 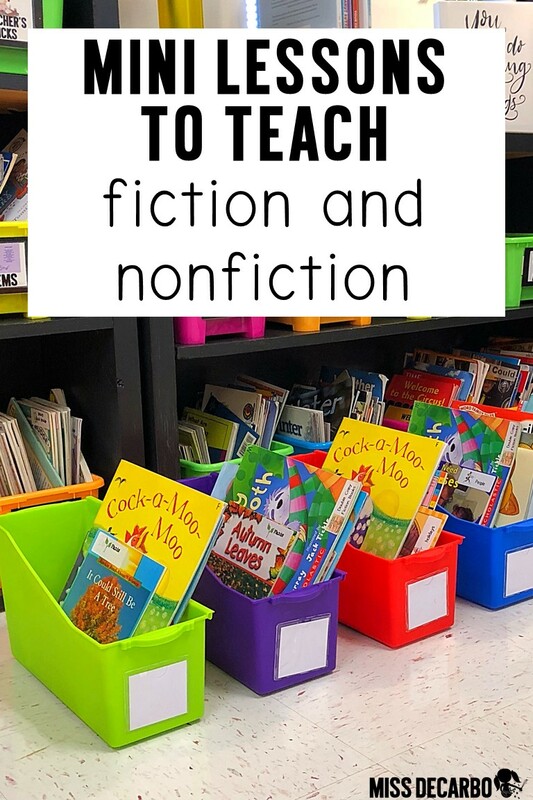 I hope you loved reading about these mini lessons for teaching fiction and nonfiction text! 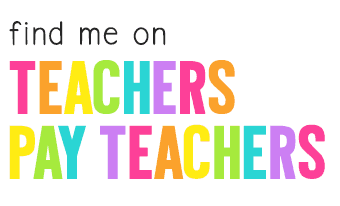 To save these ideas for your classroom, or share them with a colleague, pin the images below! You can easily refer back to this post in the future!